WebSphere® Business Integration is the IBM® business integration solution for process integration, workforce management, and enterprise application connectivity. WebSphere Business Integration helps you to create and deploy new business processes, synchronize business information in multiple business applications on diverse platforms, and transform message formats en-route between applications. 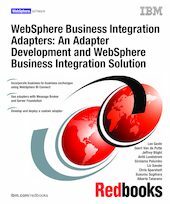 This IBM Redbooks publication takes you through the full life cycle of an adapter development project, from design considerations, building, and testing through deployment and implementation on multiple broker types (using both an out-of-the-box technology adapter and the custom adapter for our development project). For this book, we designed a scenario that mirrors many of the issues that real-life integration projects can face. The scenario starts by integrating custom enterprise applications. It then integrates those applications into the business-to-business world by extending the infrastructure. Finally, it adds a human interaction component which determines whether to take the internal route or external route (via trading partners) to application integration. Using many of the components within the WebSphere Business Integration family of products, this book includes a range of integration options that are available to implement this scenario.